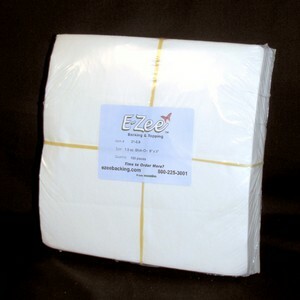 E-Zee Stick-On 1.5 ounce backing is a tear away backing with a release paper on one side. Coated with 2 mil of adhesive. Use for hard to hoop or small items such as pockets, socks, cuffs, belts and collars. Use when hoop burns are a concern such as with velour or brushed corduroy. Use for very stretch fabrics like bicycle shorts and swim wear. Also used with Fast Frames. Cut a piece from a roll or use a piece of pre-cut E-Zee Stick-On to fit your hoop size. Hoop with the release paper facing up. To expose the adhesive, carefully score an X pattern with the tip of a straight pin. Remove the paper inside the hoop area. Position the garment and press on to adhesive where the design is to be embroidered. Embroider the design and remove the embroidered item from the hoop. Tear away the excess backing. Please Note: E-Zee Tear® Stick-On should be stored in an airtight container away from heat and humidity.